In 2026, Pyramid Lake is drying up and the wicked are thriving. The bodies of over twenty men found floating in its waters baffle the locals of Gerlach, the nearby town where a crescendo in the rise of evil has slowly been creeping over them. When Herbie hears news of the mysterious Pyramid Lake massacre, he immediately suspects there's more to it than meets the eye. With the help of his friends and a local vampire slayer, they trigger a course of events that begin to uncover a massive conspiracy in the United States army, unveil the truth behind the reappearance of the Nephilim, and have Herbie dancing closer with death than ever before. Last Generation is a series of YA magical realism action and adventure novels that tells a story of the battle between good and evil that has been waging since the dawn of time. 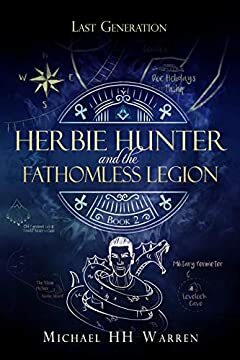 The second installment, Herbie Hunter and the Fathomless Legion opens the gate to the dark future awaiting humanity. The mystery only becomes more tangled as it unravels, and the true face of evil begins to rear its ugly head.